In our busy lives, we hardly have times for a manually prepared coffee. 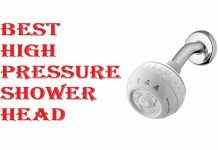 So these days people tend more to go for coffee makers to do the job easy and fast. But there are so many coffee makers are in the market with the variations in terms of quality. 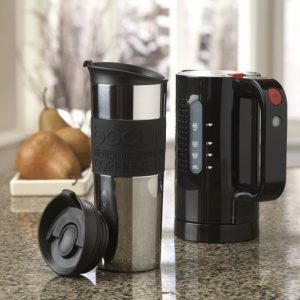 If you have considered the features with the budget, you can look for Bodum Insulated Travel French Press Coffeemaker that comes with a high-quality construction and provides tasty and healthy coffee. 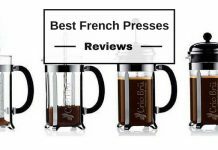 This budget-friendly travel french press coffeemaker mug has some amazing features that this article will discuss. It is known to all that best coffee is made in French presses. Using this travel french press coffeemakers mug, you can be assured that you are drinking the best coffee and the greatest part of it is, it can go anywhere with you. Thanks to the double walled stainless steel insulation, the mug is as double as a thermos. The great thing about this travel french press coffeemakers mug is you will find your coffee hot on those cold mornings when you are rushing for your office or work. Making coffee is so simple and easy in it. You just add coarsely ground coffee and then pour it in hot water, seal the lid and take it to go its way. Wait for 4 minutes, then you are free to press the plunger regardless of where you are and meanwhile your coffee is ready for consumption. Whereas, the coffee press doesn’t force you to consume the coffee immediately. 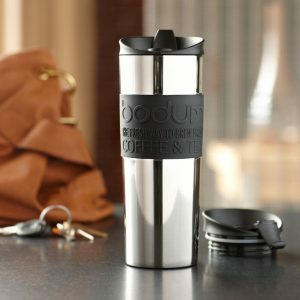 Because the insulated double walled construction remains hot for several hours providing all the freedom of a coffee lover deserves during his traveling. 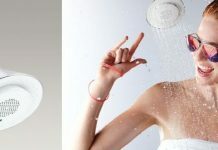 Those materials used in manufacturing this product make it very durable and resistant to tear and wear. That means you will be using it for a long time since it doesn’t chip or break. The French press coffee mug is a perfect combination for people who like to head for the office as soon as they wake up in the morning. 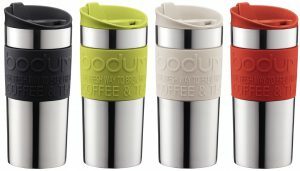 Bodum insulated travel mug is made of stainless steel, silicone. 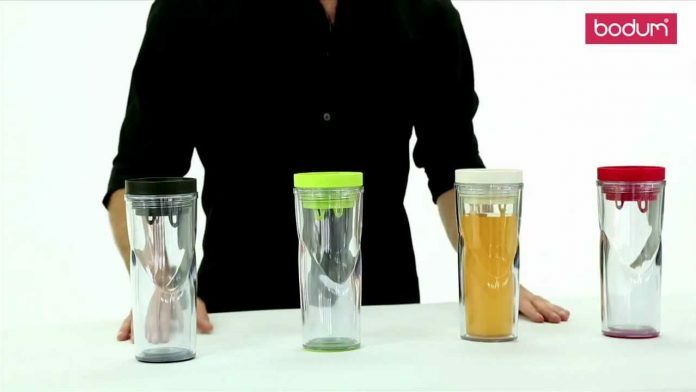 plastic and its mesh filter ensure that coffee doesn’t continue to brew while you are drinking coffee. In this press pot, you just simply drink the coffee from the same vessel you brew in it. This bodum travel french press coffeemaker comes in a variety of live, vibrant colors as black, white, red, lime green so you can choose one that goes with your personality or wardrobe. The matching coffee pot will definitely look you most stylish. The cover of the lid this insulated coffee pot used is a perfect fit for the mug. So while brewing, there will be no spilling of your coffee. The silicone grip of the mug ensures that the travel french press coffeemaker mug stays firmly in your hand and prevents slippage. One of the best features of this travel french press coffeemaker is the mug is to weigh substantially enough to prevent it being too easily knocked over but also light enough to carry it into a bag. 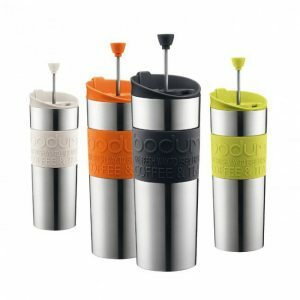 Thus the Bodum insulated travel mug feels just weighty enough, by its slightly weighted silicone base and its appearance will definitely attract any of the users. Question: Will this fit in a standard size car cup holder? Question: What is the material of the lid? Answer: It is a hard plastic. But has a great flexible seal and is easy to clean. Question: Is this version BPA free? 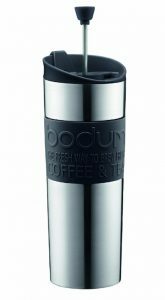 Simple transport friendly lightweight design of this Bodum Insulated Travel French Press Coffeemaker makes coffee making possible anywhere to satisfy the palate of the coffee lovers. The double walled structure makes it best for keeping coffee hot for several hours. 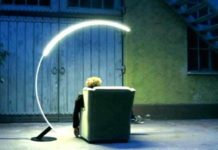 So you can extend your drinking experience for a long time without the need for immediate consumption sometimes. 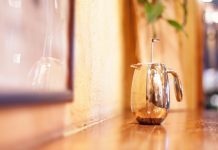 Another thing is beside the hot things like coffee or tea, you can also use this multifunctional coffeemaker for keeping the cold things cold and hot things hot for several hours serving you the best coffee.